Posted in: 1 Pageant Pages, 2 Shout-out-Looks. 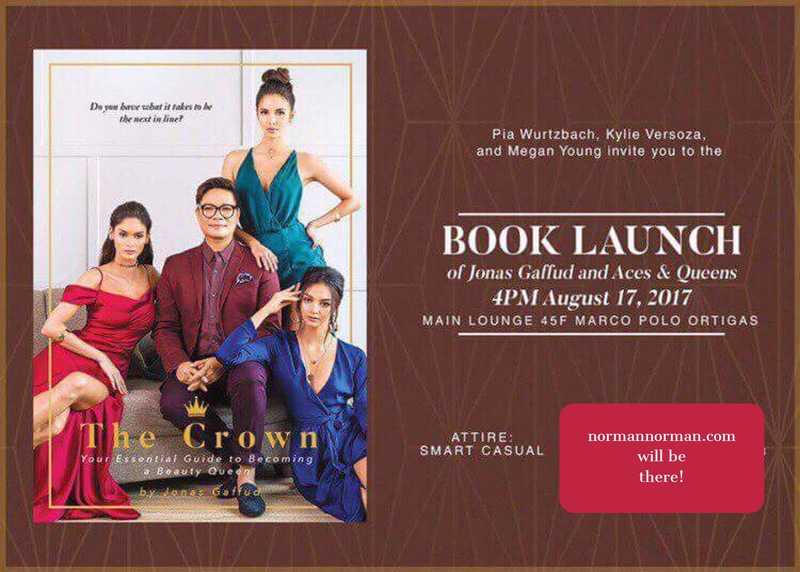 Tagged: Aces & Queens, Jonas Gaffud, Kylie Verzosa, Megan Young, Pia Wurtzbach, The Crown. Today, August 17, is going to be quite the hectic coverage schedule for normannorman.com. Starting at 1pm, there will be the Miss World Philippines 2017 Sports Challenge scheduled at the Victoria Sports Tower in QC where the fittest and the strongest among the candidates will stand out in a fast-track segment that mimics the same portion of the bigger Miss World. At 7pm tonight, the big launch of Mr & Ms BPO will be held at the Discovery Primea with the exciting unveiling of this year’s most exciting mixed search among the best and brightest in the call center industry. 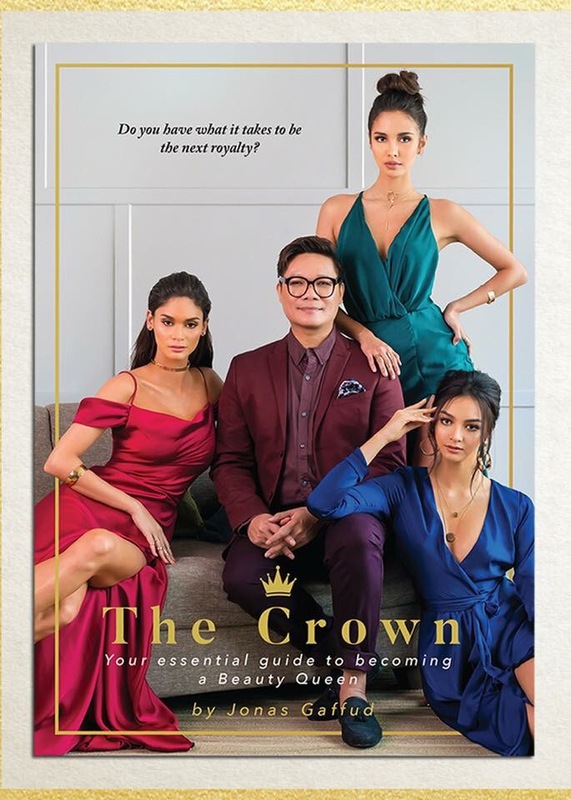 And sandwiched by the two events is the much-awaited book launch of “The Crown” by Jonas Gaffud with his three (3) muses – Miss Universe Pia Wurtzbach, Miss World Megan Young and Miss International Kylie Verzosa – leading the way into the activity. In line with this, let me inject a throwback of sorts to a year-old interview Jonas Gaffud gave to PEP.ph which mirrors some of the content of the said book. Watch the videos by PEP now. NEVER AKO BIBILI NG LIBRO NA YAN!! WHY?? IF I KNOW BAKA SINALI JAN SINA KEKE WAROBE AT MARIA POPOOTARP!!! PWE!!! Hahahaha ultimate ShaDE!!!! I love it!!!! The picture would have looked perfect if there was someone standing behind Pia – a Miss Earth from Jonas’ camp. Is there a digital copy Tito Norms? Where can I download it? I much prefer a digital copy sana. ABSCBN Publishing will very likely release a digital copy and make it available. Yey! Update us po when the digital copy comes out! I really prefer it on digital so I can bring and read it anywhere. Although when I visit the bookstores hopefully I can buy a hard copy. It is indeed much-awaited for all the pageant fans to have a copy of this book. I myself will rush to a bookstore near my work and buy one. Fans have to be grateful to Jonas for sharing his wisdom in his field of endeavor, to which each of us can very well relate. For all the successes he has reaped in pageantry, Jonas is undoubtedly an authority and has the right to release such a book. I remember in 2007, my family and friends were pushing me to join a national pageant. I said I could not do it without a guide of a pageant expert. I thought it would be hard to penetrate the pageant world and win a crown without a mentor. I was not aware that there existed Jonas Gaffud then. Had I only known him, I might have joined his mentees. Anyway, that was the past. I am happy in the field I am now. Good luck, Jonas. TALAGA YOUR FAMILY & FRIENDS WERE PUSHING YOU TO JOIN NATIONAL PAGEANT? KAGANDAHAN KA BA NAMAN DAW KAYA? ABER AONG HILATSA NG MUKHA MO PARA IPAKTULAKAN KANG SUMALI NG BEUATY CONTEST? HINDI KAYA PINAGRITRIPAN KA LANG NILA AT NANIWALA KA NAMAN KANGKAROT KA? BAKA NAMAN SA TULAY O BANGIN KA NILA GUSTONG I-PUSH! God have mercy even if you have not had good childhood memories, my dear. Believe in the power of love. If you have not been touched by any positivity in this world, at least you know that there is One up above who cares for you. I won’t dignify your words because doing so would mean going down to your level. O E BAKIT PUMATOL KA IDIOTA! ME PAGOING GOING DOWN TO YOUR LEVEL KA PANG NALALAMAN YAN E AYAN NA NGA O SINAGOT MO BOBA! NAGMAMAGANDANG PINUPUSH DAW SYANG SUMALI SA BBP E ASAN NAMAN DAW KAYA ANG GANDA NYA? IPAGYABANG BA NA PINAPUSH SYA NG PAMILYA NYA…SINO SA MGA PAMILYA MO? NANAY Mo. SYEMPRE NANAY MO KAYA GANDANG GANDA SYO! One word for this guy “Reyes”: TROLL! Don’t waste your time y’all. DON TALAGA LANG BAYOT HA? ME PA DON’T WAST DON’T WASTE YOUR TIME KA PANG NALALAMAN DYAN BAKLA KA, E AYAN O NAGSAYANG KA NA NG ORAS SA AKIN! SALAMAT SA PAG PANSIN BAYOT? Norman, please ban this idiot “Reyes”. Jusko ilan taon na yan si Angelo Reyes dito. First time ko sumali dito 2014. Nawala na ung iba, na ban na! Ako nga na ban naren dito kaya nag iba na lang ako ng pangalan yong iba na moderator mode tulad ni C2F. Pero si Angelo Reyes, namamayagpag! Besides this trio, who else have won international crowns under jonas? For all the negative things that can be said about Jonas and Aces & Queens, let us give credit where credit is due. This man did produce three queens (and a host of respectable runner-ups) in such a relatively short time. He must know what he is doing and credible enough to write a book. Congratulations and keep up the good work. WELL I HOPE ME MGA SPONSORING ADS YAN LIBRO NA YAN PARA SURE NA ANG ROI KASI DI NA MABENTA MGA LIBRO NGAYON, MAS CONVENIENT TEH ANG MAGBASA SA MGA IPOD AT MONITOR KESA MAGBITBIT NG LIBRO. KUNG MERON MAN BIBILI NYAN E MGA “KAIBIGAN” LANG OUT OF GRATITUDE O PARA MASABING CLOSE LANG SILA. SYEMPRE BIBILI RIN MGA PROTEGEE NYA KASI NGA MAY MGA UTANG NA LOOB AT MAS PAPANO NAKA FEATURE DIN NAMAN SILA. ENDING NYAN PURO COMPLIMENTARY COPY NA LANG IPAPAMUDMUD OKAYA GAGAWIN NA LANG TOKEN OF APPRECIATION SA KUNG SINO SINO! AH PARA KUNWARI MATALINO?? OO NGA NAMAN! ATE EUSTAQUIA AMPALAYA KASI AGAHAN KO AT PINAPAITAN TANGHALIAN KO! HALA SIGE PATOL PA MORE MGA BAYOT HA HA HA HA! AND REMEMBER SYO KO RIN BINILI YONG SHABU NA TINIRA KO, DI MO MAN LANG AKO BINIGYAN NG DISKAWNT! BOBG700, ATENG PAKISABI DYAN SA KA-POT SESSION MONG SI DREW E OK NAMAN AKO, MEDYO NAHILO NGA LANG AKO DON SA VIDEO NYA, KAW BA PRODUCER NON? PAKIREMIND NA LANG PLEASE KAY DREW YONG TOCINO AT LONGANISA NA INORDER NA KINUHA NYA DI PA KAMO BAYAD HANE? AT SI ALING SIMANG YON DAW LISTAHN NYA SA TINDAHAN NA DI PA RIN DAW BAYAD. AR!!! Hinde lahat ng nasa libro eh nasa internet and hinde lahat ng nasa internet eh worth it basahin. Iba pa rin ang libro. gets mo!!! When is this available in bookstores? Spot on with Venus Rah being the classiest. I remember my jaw dropping when I saw her at BBP pageant for the first time. I got the feeling that she’s paving the way for a win.. for herself or for someone after her. ..bat sa replay ng video si Venus ang pinaka graceful at si Pia ang classy..or ibang video kaya napa nood ko..hay.